Last Friday I was very kindly invited by Currys PC World and Joes Bloggers to attend a cooking event with Neff, the kitchen appliance brand. Having long drooled over their amazing ovens (they make the brilliant ‘slide and hide’ ovens used on the Great British Bake Off, fact fans), I was eager to have a play with their products myself. We met in London and then boarded a minibus to Milton Keynes to experience the Neff test kitchens. The staff were lovely – knoweldgeable, funny and charming, and were all clearly very proud of their brand and the range. When we arrived we were greeted with big smiles, hot beverages, and just-baked-still-warm-from-the-oven cookies. A very good start! Neff’s social campaign at the moment hinges on the odea of good, impressive, inventive home cooking, and they are looking for ‘Cookaholics‘ – I liked this graphic outlining a candidate for the moniker! Austin from Neff took us through the range of ovens and their many capabilities. I have to say, I was really impressed – as well as the #SlidingOvenDoorsOfJoy, they also have many other tricks up their sleeves – no real need to preheat as they come to temperature within minutes, pyrolitic cleaning (where high temperatures do the work for you! ), and a wonderful technology called Circotherm where the circulation of air within the oven is changed so you get no intermingling of flavour. You could cook a fish course, a vegetarian course, and a sponge cake in the same oven and they’d all retain their own flavour with no crossover. Which is fortunate, as fishy sponge sounds vile! So shiny. I love our little clatter-bang oven, but I’d love one of these babies to play with! So much space, so many recipes to try! Once we’d been introduced to the technology, it was time to cook – as food bloggers we were ‘singing for our supper’ and making the items we’d be enjoying for lunch and afternoon tea. Love events like this! My team were in charge of making these quick and tasty tartlets which only had three ingredients – perfect for a quick weekday supper or to rustle up for a get-together. We used shortcrust pastry for the base (either homemade or shop-bought would work well), then spooned in red onion chutney and topped with a little goat cheese ‘hat’! Glaze with a little egg and milk and then cook in the oven until golden, with the cheese bubbling. 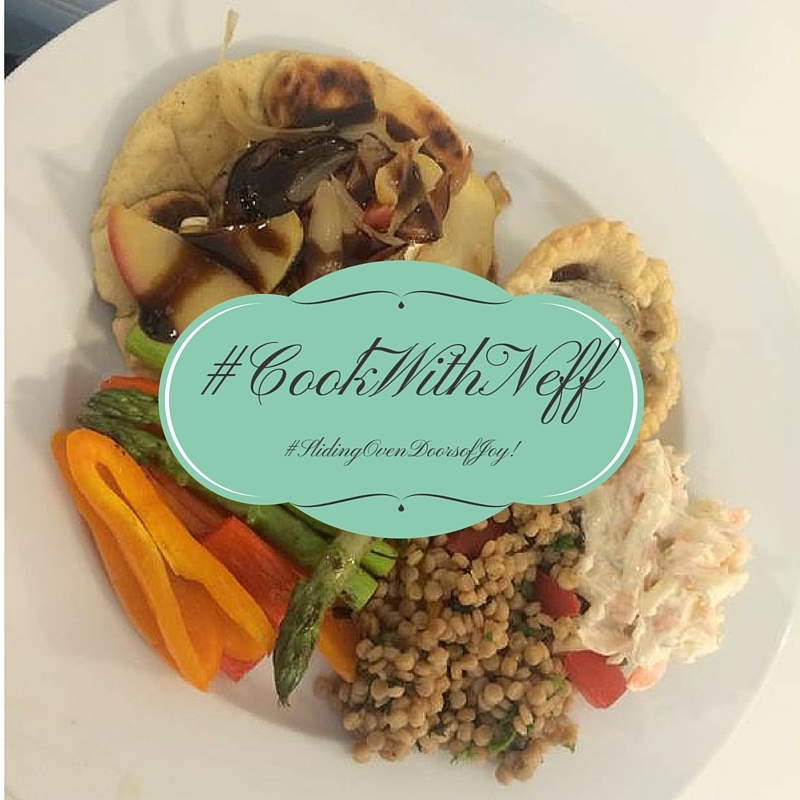 Other teams made other elements of the meal – posrk & wild boar patties, flatbreads, vegetable tart, salmon and asparagus tartlets, and a giant cous cous salad. There were also people beavering away on pudding. My lovely team – Amanda from Rhyme and Ribbons and Jessica from Look What I Got. Across from us on the workbench and in charge of the cous cous salad were this smiley team of awesome! While the tartlets baked, it was time to slice and dice some veggies! We were going to griddle them to have alongside the other options. Once all the articles were ready, it was time to set up for a feast! Tartlets! A couple got a bit squished while we were taking them out of the tin but I can assure you they were no less delicious! Pork & wild boar patties with herbed creme fraiche. My lovely (and very on brand) lunch! I snapped Sophie from Sophie etc. making our pudding earlier in the day – love a good chocolate dipped strawberry! Lyn, Neff’s Senior Home Economist, was so good at explaining the recipes and the many capabilities of the ovens. I loved the little water feature she showed us – perfect for recipes like bread making where a little steam works well! She showed us how to use a simple white bread mix to make a tasty ‘tear and share’ option – one side was cheese and proscuitto, the other bake was cinnamon, apple and nuts. I loved the warming drawer for proving! Bloggers ready for afternoon tea! A well earned cuppa and a light, fluffy scone! In Lyn’s recipe we used a little yogurt in the mix, rendering the finished bake light and fluffy. After tidying up and saying our goodbyes, it was bake to London, bellies full and cooking souls inspired! Thank you to Neff for hosting; to Currys PC World and Joes Bloggers for inviting me; and to all the bloggers in attendance for a fun, lively day. I think Sophie’s reaction sums up the door joy perfectly! Disclaimer: I was invited to this event and fed lots of yummy food. I was not paid for this review, and all opinions are my own. I really like cooking. Absolutely amazing quality! If/we we redo our kitchen they'll definitely be on the wishlist.